Father's Day is this Sunday June 21st. My Dad passed a couple of years ago and Jim's Dad passed about 5 years ago. But, I can always appreciate my husband, who is a father, so I decided to make him a card. I was working on the Mojo Monday sketch challenge for this week and decided to do another card using the bokeh technique that I like so much. 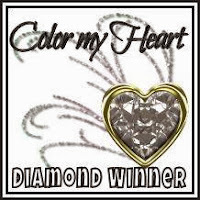 The Color my Heart Color Dare challenge came up also and they presented a monochromatic challenge. Easy, peasy, Jim likes blue so here comes Crystal Blue, Glacier, Indian Corn Blue, and Outdoor Denim. I think bokeh works best with lighter colors. I originally did a card with blues and chocolate but the chocolate didn't go on as I expected. You know, sometimes I have problems with my expectations...please tell me I'm not the only one. Lighter colors will blend with each other giving additional colors to your background. This is not as obvious with the monochromatic theme. Regarding the bokeh dots, I did not use my stamp pad this time. It's getting contaminated with color. Then using either a sponge dauber of a piece of sponge cut up I dabbed a small amount of the White Daisy paint over my bokeh template of cut out various sized circles. Randomly select a size, placement and depth of color to make white dots. For the circles I used the Cricut cartridge Art Philosophy (circle 1 and circle 2) to cut Indian Corn Blue cardstock cut to 2 3/4", Blossom X7194B paper cut to 2 1/2", and white cardstock 1385 cut at 2 1/4" in a scalloped circle sponged with Crystal Blue and Outdoor Denim inks. 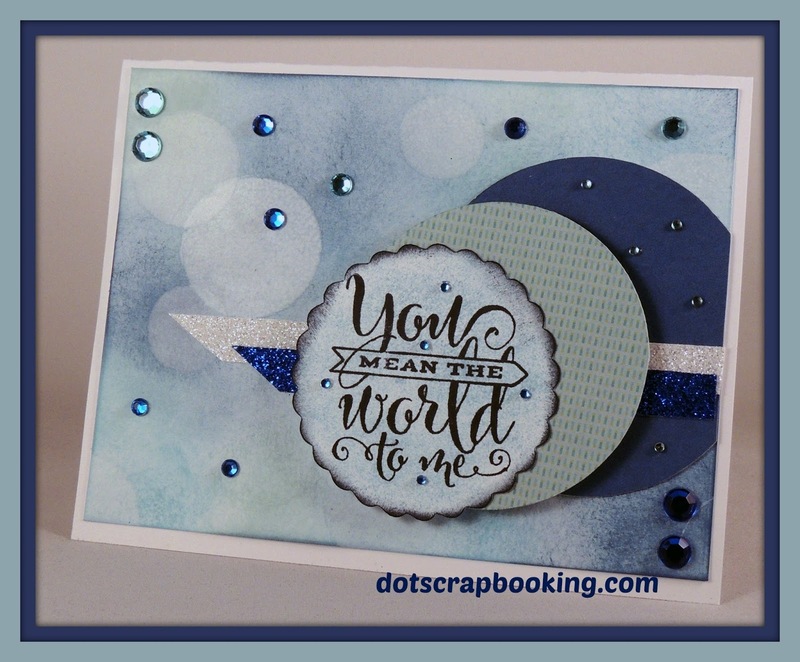 The sentiment is from the "You Mean the World to Me" B1467 stamp set. The embellishments are White Shimmer tape Z3024, Blue Shimmer tape Z3025, and blue sparkles that are a discontinued item. Happy Father's Day to all the fathers!! Another fabulous card! Love the dreamy background and scattered bling! Your Bokeh effect is great! I love that look, but mine doesn't ever seem to turn out that beautifully! Great card! The bokeh technique goes beautifully with your card's circle theme! This is just beautiful! Thanks for joining us at Color My Heart Color Dare! What a fabulous & fun card. Love this sketch and how you added all the embellishments. Thank you for inspiring us at Color My Heart Challenge Blog. Oh my, this is awesome!! I love the bokeh technique and perfect for this card!!! Thank you for playing along with Color My Heart.